It’s a weird world…find your place in it. The revived copper mining ghost town of Jerome, Arizona is not only filled with historic buildings and a rich history, but is also said to be the home place of a number of lingering ghosts. Today, Jerome is an artist’s and tourist’s community of about 400 residents, but that has not always been the case. During its prosperous copper mining years, the town boasted some 15,000 residents, and was so filled with vices that it earned the nickname of the "Wickedest City in the West” by a New York newspaper. During those days, people died in mining accidents, gunfights, overdosed on opium, and a number of other unnatural events. With its ribald past, it comes as no surprise that the city is allegedly filled with wandering spirits. The White Eagle Saloon, located at 836 N. Russell St., is one of the most haunted places in Portland, Oregon. It is also one of the many small venues here in Portland that have become world famous for presenting such musical icons as ZZ Top, Robert Cray, The Holy Modal Rounders, Big Walter Horton, The Isley Brothers and a veritable plethora of other greats over the years. The White Eagle was built in Portland's Albina district in 1905. Opened by two Polish immigrants, Barney Soboleski and William Hryszko, to offer other Polish immigrants a place of after-work recreation: pool, cigars, poker, liquor, beer, etc., according to the lore, with the right connection and proper amount of money, patrons could also indulge in a brothel upstairs or an opium den downstairs. Creaky footsteps around a dark corridor, disembodied knocking on cold concrete walls and iron bars worn smooth from the hands of tortured prisoners – these are just some of the experiences guests might expect when checking in for a night at an infamously haunted hostel in Ottawa. Weary travelers looking for undisturbed sleep may be best to skip the Ottawa Jail Hostel, which sits at No. 9 on travel website Lonely Planet's list of the world's spookiest buildings. It's ranked just behind Ukraine's Chernobyl Reactor No. 4 and ahead of White Alice, Alaska. From 1862 to 1972, the building was home to the Carleton County Jail, a maximum security institution with tiny cells, glassless windows and public executions. From 1862 to 1972, the Ottawa Jail Hostel was home to the Carleton County jail, a maximum security institution with tiny cells, and glassless windows. Ottawa Jail Hostel sits at No. 9 on travel website Lonely Planet's list of the world's spookiest buildings. The Ottawa Jail Hostel was built in 1862 and is reported to be haunted. (Image courtesy HI-Ottawa Hostel). Hostelling International bought the building in 1973, creating what is now a quirky and sometimes scary place for intrepid tourists to spend the night. Guests sleep in the former cells, some of which have their original bars. Wandering the building, they might also stumble upon original gallows, stairwells, secret tunnels and even death row. Glen Shackleton, director of Haunted Walks Inc. which hosts guided tours in the building, said the hostel has all the ingredients in a perfect recipe for haunting. "It really was like a medieval prison, a lot of people died there and they were buried in the yard," Shackleton told CTVNews.ca on Monday, adding that many of the bodies remain in their final resting place. The most commonly reported spectral sighting is of a man who appears at the foot of guests' beds, sometimes clutching a Bible. Shackleton said the description usually matches that of Patrick James Whelan. Whelan was hanged at the jail in 1869 in front of 5,000 spectators for the assassination of politician Thomas D'Arcy McGee. Shackleton said Whelan's ghost may be still roaming the halls of the hostel due to an unceremonious burial in the yard – after he was promised by a judge to be buried in his family's plot in Montreal. "He's the No. 1 suspect as far as hauntings are concerned," he said. Shackleton, who has been doing tours for 16 years, said that he's experienced some strange incidents while in the old jail, including loud knocking on doors and heavy footsteps around corners. "I think everyone wants to see or experience something for themselves, it's a big mystery," he said. "Most of us are unsure whether we believe in ghosts, but that doesn't mean we're not afraid." Shackleton said although the alleged hauntings have made the hostel famous, one of the most important aspects of the hostel is its preservation as a historical site after it was doomed to be destroyed in the 1970s. "The dark side of our history is just as important as the rosy side," Shackleton said. As mentioned, newspapers all over the country reported on the trap that Floyd had gotten himself into. A number of reporters tried to reach Floyd for interviews but the most successful was a cub reporter from theLouisville Courier-Journal named William Burke “Skeets” Miller, who later won a Pulitzer Prize for his coverage. Miller’s nickname (for “mosquito”) came from his diminutive size, which enabled him to slide down the narrow path and sit with Floyd where he was trapped. He made eight descents into the cave and conducted a series of interviews that were quickly relayed to his readers as a first-hand account of what it was like to be literally buried alive. There are many historical buildings in the Dawson City area that have been said to be haunted, but there are a few that are more prominent than others. The first is the Commissioner's Residence. Anyone will tell tourists that the place is beautiful inside, but few will venture inside. It was built at the turn of the century and the last commissioner to stay there was the Blacks in 1916. After that it was used as senior citizens home. Apparitions have been reported as well as voices, and footsteps on the higher floors. The second historical building to be focused upon is the Palace Grand Theatre. Klondike Kate is said to haunt her former dressing room. She was welcomed to the "Paris of the North" with great acclaim. She was a wonderful show person and died at the age of 80. The theater open in 1899 and is now housing performances that reflect the old west. Klondike Kate's hay-day was most certainly at this hotel and so it is where she stays. There are many other buildings to be seen (such as the Administration Building), but none so haunted as these two. In 1898 the Westminster Hotel came to Dawson City and was set up (as all things in Dawson City were) as a direct result of the Klondike Gold Rush. In 1901 it was officially registered and is also known by its other name, "The Pit." It was a grocery store in the very beginning with some rooms to let upstairs, but not enough to call it a hotel. It floats on ice and is considered to be preserved in the best condition as possible. Voices, things going bump in the night, and objects moving through the rooms have also been reported. With its long history, how can it not? Dezadeash Lodge itself is said to be in ruins and abandoned. It sits on the lake of Dezadeash and the view is said to be something else. There are many rumors about the lodge, but from what has been heard there is ghost that is lodged here. It is said to be very creepy and strange noises have been experienced from within as well as shadows being seen. Dezadeash Lodge was originally known as the BeLoud Post. It was a full service lodge for those who were coming to this area for the gold rush. Fishing and skiing is the prime appeal of the area now, but few who look at the Lodge must suppress a shudder for what they believe is inside. There is a haunted barrack at the Whitehorse Cadet Summer Training Center. Before it was the before said training center, this place was a youth detention center. In the B2 barracks it was said that an inmate hung himself from the rafters. Many have claimed that there is the sound of this inmate calling out in the midnight. From the outside, the Wabasha Street Caves looks like a normal building. The structure itself was built into the side of a cliff back in the late eighteen-hundreds and used for mining silica. Over the years, this structure has been popular as a gangster hideout, a place for mushroom farmers to grow their products, nightclubs and more. Today the Wabasha Street Caves offer fine dining, entertainment and tours. The paranormal reports here continue to this day. The apparition of a gentleman wearing a Panama hat has been seen in various areas of the caves. Another male apparition is said to spend his time with a female apparition at the bar and the two are often seen together around three in the morning. Also, a second female apparition has been spotted roaming throughout the passageways. In the early 1930’s, three gangsters were reportedly gunned down within the caves. One of the gangster’s apparitions has been seen in full-bodied, solid form and has appeared right in front of unsuspecting patrons in the cave corridors! All three of the gangster’s apparitions have been seen by a few children and have even been reported to play with them before disappearing into thin air! The Koestler Parapsychology Unit (KPU) is a research group based in the Psychology Department at the University of Edinburgh. If you’re in the area, you can volunteer for many of their studies. A form of silent rebellion, the slaves at Magnolia often used voodoo to cast evil wishes on their oppressive masters. The enslaved blacksmiths were tasked with forming the metal Christian crosses that marked the Lecomte family graves. While the crosses were beautifully ornate, they also included West African voodoo symbols hidden within the design. As the Civil War ravaged the American South, Federal soldiers closed in on Magnolia's main house and turned it into a stronghold. The slave quarters were then named sharecropper housing; however, the lives of slaves did not change much. Instead of being owned property and working only for room and board, the slaves became free sharecroppers, working for script they could only use at the plantation store -- again, mostly for room and board. The enslaved workers continued to use voodoo as spiritual revenge for such an unfair life. Grave of the first known murder victim of Schuylkill County, Jost Folhaber. Central State Hospital or Asylum, was deemed the "hospital for the insane" by the Indiana state legislature, and opened its doors in November of 1848 and was finally closed down in 1999. The site consists of several buildings on a large plot of land on the west side of Indianapolis. Many of the buildings at this location are alleged to be haunted due to some of the atrocities that took place while the asylum was still in service. Whether it is or not, as any haunted attraction is concerned, is debatable. But I can say that the vibe of this place creates a certain tension in the air that could be described as....well....off. The island was uninhabited until 1885, when Riverside Hospital moved there from Blackwell's Island (now known as Roosevelt Island). Riverside Hospital was founded in the 1850s as the Smallpox Hospital to treat and isolate victims of that disease. Its mission eventually expanded to other quarantinable diseases. The island was the site of the wreck of the General Slocum, a steamship which burned on June 15, 1904. Over 1,000 people died either from the fire on board the ship or from drowning before the ship was beached on the island's shores. Typhoid Mary was confined to the island for over two decades until she died there in 1938. The hospital closed shortly thereafter. Situated between the Bronx and Riker’s Island is a small parcel of land in the East River known as North Brother Island. For any urban explorer, due to the island’s proximity to the city, airport, power plant, water treatment facility and Riker’s prison, it's monitored by both the NYPD and coast guard. So if you want to visit, you must be very sneaky. Smithtown natives are already aware of the supernatural occurrences at Katie's of Smithtown. Swinging doors, mysterious footsteps, and other poltergeist phenomena have become common occurrences since Brian "Big Bri" Karppinen opened Katie's in 2000, and those strange happenings have since become legendary in the Town of Smithtown. In fact, Smithtown natives had already been turning the rumor mill about the building's "curse" decades before Brian purchased and renovated the beloved Katie's. Unafraid of those spooky rumors, Big Bri set up shop in the historical building, and was soon hosting theme nights. On one such night, psychics were invited to come in and speak with Katie's patrons. After the event, psychic Janet Russell informed Brian that a spirit, identifying himself as Charlie, frequently visited and considers the bar his hangout. Skeptical at first, Brian invited different psychics to the bar, but did not inform them about the previous medium's experience. As before, the mysterious Charlie appeared, and Brian began to learn more about the spirit's love of girls, cigars, fine beers, and tossing the occational wine glass. The Traynor Hotel burned down on the spot on which Katie's sits in 1909. Investigators sense that a dark entity in the basement level is someone who had worked in the hotel and died when he was crushed in the fire. Famed psychic Chip Coffey asserts that another dark entity is a 16. century, Dutch-born murderer. Coffey senses that the spirit is remaining on this Earthly plane because he is fearful of Hell. These entities are especially interesting to the investigators because of the effect their presence has an those who encounter them: nausea, heaviness In the chest, difficulty breathing, sleep-paralysis, and even out-of-body experiences. Further, the team became intimately acquainted with these spirits when two of the investigators and one crew member were "attacked or violated" (Ryan Buell, 2008). Katie's most famous ghost, a bootlegger and bartender named Charlie Klein, did, in fact, live across the street from Katie's during the 19200 prohibition era - and ultimately killed himself before the decade was out. One Smithtown elder even admitted that his own children, who lived in the building, had spoken of Charlie's appearances over the years. Since Paranormal State's initial investigation, Brian was since been able to get in touch with the mysterious Charlie's own decedents, inviting them to the bar and celebrating the late bartender's life, perhaps in the hopes that honoring his memory would purge the bar of his restless spirit. Skeptics speculated that glasses were tossed due to a train passing, but investigators, using a seismograph, debunked their theory. Skeptics further asserted that a heavy feeling in the chest and other physical symptoms experienced in the basement were due to a gas leak. This theory was debunked as well, as Katie's has not had a gas hookup in the building since 1991, and no leak was detected with testing. To this day the phenomena continue. The Investigators from Paranormal State returned again in 2008 for an update, only to confine that the spirits remain. Ospedale pedagogico di Aguscello, Italy : State school/developmental center, sanatorium/isolation hospital. It was originally a residence built circa 1870 and changed hands for a few years, until a Doctor Bernardi purchased it to be used as a Tuberculosis clinic. In 940 it was sold to the Italian Red Cross (Croce Rossa), who apparently treated young children with physical and mental illnesses (TB, epilepsy, etc). In 1837, the Newark Street Jail was constructed to house criminals from the Essex County, New Jersey, at a cost of $30,000. It replaced the prison at the county courthouse, which burned completely in 1835. The architect John Haviland, designer of the state prison in Trenton, envisioned a two-story square building attached to a cell block wing, crafted from brownstone and brick. Garden paths, courtyards, and a greenhouse were included for the better-behaved inmates to work at and enjoy. In the 1890s, the facility was expanded with new buildings as well as additions to the main structure; technological improvements included running water and sewerage. The name of the facility was changed to the Essex County Jail, and eventually exapnded to include over 300 cells. An interesting (but hard to see) feature at this facility are the thick glass panes installed as flooring for the narrow catwalks that line the cell blocks; designed so guards could keep an eye out above and below. Although covered with years of grime and garbage, they are still mostly intact and sturdy. In its lifetime, the Jackson Sanatorium has had many names and uses. First a rehabilitative health center, Dr. James Caleb Jackson created the first breakfast cereal. After the Civil War, people came to cleanse in the natural springs of the then, "Our Home on the Hillside". The army also used the building as a psychiatric hospital for World War I veterans. The sanatorium closed for good in 1971 but still explorable. Google 'Chicago's most famous ghost' and every websites says Resurrection Mary. This young apparition has been appearing along Archer Avenue and in the area's most hopping dance halls since the 1930s. Dozens of people have reported seeing her, and all of the stories seem to have a similar theme. The story of Resurrection Mary is a typical vanishing hitchhiker scenario: The first report of Mary's existance was from Jerry Palus in 1939. Jerry was at one of his favorite dance halls when he noticed a beautiful blonde woman. They danced all night, and she asked him to give her a ride home down Archer Avenue. She got out in front of Resurrection Cemetery and disappeared. Another report was recorded by Suburban Trib columnist Bill Geist. He interviewed a cab driver in 1979 who claimed that he picked up a young woman in a white party dress and matching shoes. As he drove down Archer she told him to stop the car. When he did, she disappeared. Several other men have reported giving a ride to a young women in a white dress who instructed them to drive her down Archer, then disappeared when they get close to the cemetary. There have also been dozens of reports made by people who either had to slam on the brakes because a young girl in a white dress ran out in front of the car or who have seen her walking down the middle of the road. In 1976 a couple reported seeing a young girl who appeared to be locked inside the cemetery. When police went to search for her they found that the bars on the front gate had been burned; but the burns were shaped like hand prints. The cemetery denied it was anything but a maintenance accident and eventually sawed off the bars to stop the flood of people who came to see it. Some people think she was Anna 'Marija' Norkus who died in a 1927 car accident on her way from the Oh Henry Ballroom. Curtains rumbling, shower curtains swaying, pictures flying—it's all par for the course at the Historic Anchorage Hotel. Stories of ghostly happenings have been circulating at the hotel for many years and are considered to be related to the death of the first Chief of Police, Jack Sturgus. On February 20, 1921 at 9:15 p.m., Anchorage's first Police Chief John J. "Black Jack" Sturgus was found shot in the back with a bullet from his own gun, steps away from the Historic Anchorage Hotel. It is rumored that his ghost returns to the scene of the crime each year, haunting the location of his untimely death, seeking justice for a crime still unsolved to this day. Sightings are so frequent that we keep a ghost log in which a number of our guests have shared their encounters. In addition to the ghost of Jack Sturgus, there are several different specters that past guests have seen make their way through our halls and facilities. The frequent reports of paranormal activity and ghost sightings resulted on Living TV's, Most Haunted, to investigate the vaults in both a 24 hour investigation and for a Most Haunted Live show on Halloween 2006, in which Scottish Investigator Ryan O'Neill took part in due to his paranormal knowledge of this location. The television show Ghost Adventures investigated the vaults and claimed to have numerous encounters with spirits there. In 2001, Professor Richard Wiseman of the University of Hertfordshire invited subjects to spend time in the Edinburgh Vaults. His study concluded that people who believed in ghosts reported more supernatural experiences than disbelievers, that participants consistently reported unusual sensations in areas they were told were haunted, and that there was an increased report of incidents in Vault rooms with a decidedly more sinister visual appearance or stronger cold air flow. Professor Wiseman’s study suggests that visitors may help create the haunted experience they expect to find in the Vaults. 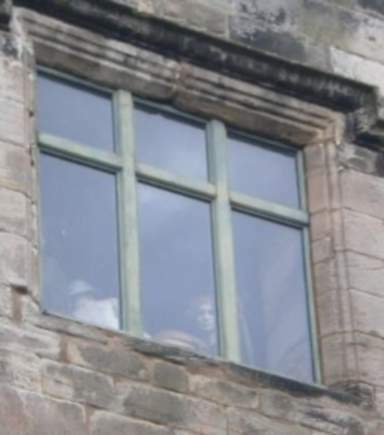 Lots of different sightings witnessed by people, staff and other paranormal investigators. The most notable is ghost of a man with no face that gives off an evil presence. Every day in the town of Jim Thorpe in Carbon County, a hanged man proclaims his innocence in the only way a dead man can. Since 1877, his hand has been raised in protest in the last home he ever had—the Carbon County Jail cell number 17. This permanent marker on the cell wall has resisted cleaning, repainting, and even replastering. A couple of days after every attempt to cover it up, the handprint comes back. And a story of persecution by evil mine owners comes back with it. In those days, innocence was no defense, so he died that day. But his handprint remained, and came back even after it was scrubbed off. Over the next century, the cell was cleaned, repainted, replastered—and always the hand reappeared in a day or so. It’s still there to this day, and on exhibit at the Old Jail Museum, housed in the old Carbon County Jailhouse. Tours are offered daily—where you can see not only the handprint, but also the National Enquirer article telling the story of it. As museum displays go, the article is a pretty sensational read—but then again, the story is pretty sensational too. You can read more accounts of Pennsylvania’s many Unexplained Phenomena in Weird Pennsylvania. Countess Elizabeth Báthory de Ecsed (Báthory Erzsébet in Hungarian, Alžbeta Bátoriová in Slovak; 7 August 1560 – 21 August 1614) was acountess from the renowned Báthory family of nobility in the Kingdom of Hungary. She has been labelled the most prolific female serial killer in history and is remembered as the "Blood Countess," though the precise number of victims is debated. After her husband Ferenc Nádasdy's death, she and four collaborators were accused of torturing and killing hundreds of girls, with one witness attributing to them over 650 victims, though the number for which they were convicted was 80. Due to her rank, Elizabeth herself was neither tried nor convicted. But upon her arrest in December 1610, she was imprisoned in Čachtice Castle, now in Slovakia, where she remained immured in a set of rooms until her death four years later. Later writings about the case have led to legendary accounts of the Countess bathing in the blood of virgins to retain her youth and subsequently also to comparisons with Vlad III the Impaler of Wallachia, on whom the fictional Count Dracula is partly based, and to modern nicknames of the Blood Countess and Countess Dracula. Editor's note: She is rumored to still haunt the castle ruins. First built in the 11th century by none other than William the Conqueror, Warwick has seen more battles than perhaps any other castle in Europe. It has found peace in recent years, but the spirits still linger. Its eroded walls and faded battlements tell the tale of a long hard life for the spirits that now walk its halls. The ghost tower is said to be one of the castle's most haunted areas, as Sir Fulke Greville still wanders its interior. Murdered by his manservant in 1628, he is said to materialize from his portrait late on cold evenings. The castle dungeon, home to all sorts of past torment, also seems to be quite haunted. Many visitors complain of vertigo and nausea upon touching the dungeon apparatuses. Built by the Prince-Bishops of Salzburg, Moosham Castle has a strange and sinister past. Hundreds of witches were beheaded within the walls of Moosham, and many still haunt the Austrian castle. Due to these hauntings, the castle is known colloquially as the Witches Castle. In addition to being home to a coven of creepy witch ghosts, Moosham is also allegedly the lair of the werewolf. During the 1800's, Moosham saw a sudden preponderance of mutilated cattle and deer corpses. As a consequence of this, several Moosham residents were tried and imprisoned as werewolves. Some places are simply haunted by a ghost or two, but Dragsholm, located on an islet in Denmark, is allegedly home to 100 ghosts. How anyone came to take inventory on the ghosts and find such a round number was likely done with some relation to Dragsholm tourism development, but the place is wicked haunted, having functioned as both a prison and a battle fortification. Some consider it the most haunted castle in the world. Of the many stories about Dragsholm's ghosts, perhaps the most terrifying origin ghost tale involves the White Lady. Before she wandered the castle halls as a ghost, the White Lady was just a girl – a girl who was in love with one of the castle laborers. As a member of nobility, her father, and owner of the castle, condemned the relationship, but the affair persisted. Eventually, the father grew so angry about the ongoing affair that he imprisoned his daughter in the walls of the castle. She was not seen again until hundreds of years later. In the 20th century, during some routine castle remodeling, workers found a skeleton in one of the walls. The skeleton was wearing a white gown. A picturesque castle with one of the richest interiors in all of Deutschland, Eltz rises up out of the surrounding Mosel forest as if boasting its longevity to the surrounding environs. A testament to its strength as a stronghold, Eltz Castle is one of few castles in the region that has never been destroyed. It is also one of just a few German castles that is said to be haunted. Allegedly, the ghosts of medieval knights still patrol the castle, which, 33 generations later, is still owned by the same original family. Imagine living in the same house as your Great X 30 grandmother. In adjusted today dollars, Belcourt Castle cost its owner over $100 million back in the 19th century. Oliver Belmont, namesake of the Belmont stakes, heir to the Belmont family empire and poster child for turn of the century trustfund champions, built this behemoth. On its completion, Oliver chose to instead travel the world, collecting artifacts for the castle, which sounds like a pretty cool thing to do after building a gigantic home. The years were not kind to the castle and disrepair plagued it for much of the 20th century. In 1956, the mansion was sold to the Tinney family for $25,000 ($200,000 in today dollars), or about a fifth of a penny on the dollar (adjusted for inflation). Located in the forests north of Prague, Houska castle was never a strategic battle location. It also appears to have no function of outside fortification. It was not built to repel attacks or to keep things out. It was built to hold something in. It was built to close the gateway to hell. The castle is built upon a fabled bottomless pit from which winged creatures and half-man-half-beasts allegedly exited. Demonic activity persisted at this site and eventually, Bohemianrulers decided to seal up the gateway with a castle. Before sealing off Hell's realm, it is said that nearby prisoners were granted pardons if they would agree to be lowered by a rope into the hole. The story goes that the first lowered prisoner let out a yell after entering the hole. When he was raised up, he appeared to have aged over 30 years. He died of unknown causes just days later. The appropriately named Chillingham Castle is located in the northern corner of England and has been haunting guests for a very long time. The castle served as a fortress to repel attacks from the Scots in the north and has thus seen a great deal of bloodshed. Chillingham has been featured on at least six ghost-related shows, and the webs are rife with strange pictures of its ghosts and orby videos. So what haunts this medieval castle that appears to be plucked from Westeros? Most notably a childlike ghost, called the blue boy. The blue boy is seen regularly in the pink room as a flash of blue light and also above guests' beds as a blue halo following a loud cry. Perhaps most creepy is one of the castle's ghostly apparitions who wanders the dank halls late at night – John Sage. John Sage has a terrifyingly ridiculous backstory and was hung by Longshanksduring the war with the Scots. He can be heard dragging bodies here and there. In May 2002 Sean Ryan, a world-class musician, and along with his wife Anne, owner of Leap Castle, found a ghostly old man sitting in a chair by a downstairs fireplace. Having bade his phantom guest "good day," Sean continued about his business. After all, a new ghost dropping by unannounced, is just part of life’s rich tapestry, when you happen to live in what has long been considered Ireland’s most haunted castle. Standing upon a vast throne of solid rock, Leap Castle was once the stronghold of the warlike O’Carrolls and its eventful history is mostly written in their blood. In the 16th century, O’Carroll of the Leap held a lavish banquet at his family fortress and invited a rural branch of his own sept to partake of his hospitality. No sooner had the unfortunate guests sat down to dinner, than he massacred everyone one of them. Inter-clan bloodshed was a common occurrence and members of the tribe, attended family get togethers or re-unions at their peril! Following the death of Mulrooney O’Carroll in 1532, a bitter dispute over succession arose. As siblings battled each other for leadership of the clan, "one-eyed" Teige O’carroll is said to have slain his own brother, who was also a priest, as he celebrated Mass in "The Bloody Chapel." However, the days of O’Carroll occupancy were drawing to a close, and they were about to lose possession in a suitably blood- thirsty manner. A 17th century daughter of the clan fell in love with an English soldier named Captain Darby, who was being held prisoner in the castle dungeons. She smuggled food to him and eventually engineered his escape. As they were making their way down the staircase, her brother suddenly confronted them, and the captain silenced him with a single sword thrust. Since his lover then became the heiress to Leap Castle, it passed into the ownership of the captain’s family when the two were later married. The last of the family to own Leap Castle was Jonathan Charles Darby who arrived here on 16th July 1880. In 1909, his wife Mildred wrote an article for the Occult Review describing how she had held several séances at the castle during which she had attracted the unwelcome attentions of an elemental – a primitive and malevolent force that attaches itself to a particular place. Mildred Darby described how she was "standing in the Gallery looking down at the main floor, when I felt somebody put a hand on my shoulder. The thing was the size of a sheep. Thin gaunt and shadowy… its eyes which seemed half decomposed in black cavities stared into mine. The horrible smell...gave me a deadly nausea. It was the smell of a decomposing corpse…"
Mildred’s occult dabbling also appears to have awoken other malevolent forces within the walls of Leap Castle, and it was at this time that the its fearsome reputation became firmly established. Following its destruction by fire in 1922, workmen who had commenced gutting the interior, discovered an oubliette – a small dungeon whose name, derived from the French oublier, meaning "forget," says it all – behind a wall of the bloody chapel. This sinister little room was crammed with the mortal remains of the unfortunate victims of Leap Castle’s bloody and brutal past and three cartloads of human bones were eventually cleared away from this ghastly charnel house. Over the next seventy years, it remained an empty shell, its fearsome reputation ensuring that the locals shunned it, particularly at night when all manner of ghostly activity was known to stir within its moss clad walls. From across the fields people would watch the window of the "Bloody Chapel" suddenly light up, as though hundreds of flickering candles were blazing within. Some, who dared walk amongst the ruins, experienced alarming encounters with a lustrous lady wearing a billowing red gown. In 1972 the castle was purchased by an Australian of Irish decent who sold it to Sean and Anne Ryan in 1991 and Sean set about converting the ruin into a habitable family home. Shortly afterwards, restoration was suddenly halted when the ladder he was working from was inexplicably pushed away from the wall forcing him to jump several stories and sustain a fractured knee. No sooner had he resumed work, than another freak accident caused him to break an ankle. "We began to think that we weren’t welcome here," Anne Ryan stoically observed. Today though, the spirits have come to accept the latest inhabitants of the castle and appear contented to exist alongside Sean and Anne. They may, occasionally, make nuisances of themselves but, on the whole, they are no longer malevolent. The sound of traditional music now wafts beneath the rafters as Sean entertains guests and visitors both on tours and at storytelling nights. And, should a stray sprite or forlorn phantom chose to make an appearance, they are more than welcome to pull up a chair and enjoy the atmosphere of the place that they have helped imbue with the reputation of being Ireland’s most haunted castle. The Tor has been associated with magic and mystery for thousands of years. It seems likely that early man used the tor for rituals, and maze like path has been identified spiralling around the tor seven times. Professor Philip Rahtz dated the terraces to the Neolithic period, and concluded that they may have been part of a maze. According to folklore the tor is the home of Gwynn ap Nudd, the king of the underworld and is a gateway into the realm of Annwn. The tower, which crowns the tor, is all that remains of a church dedicated to St Michael, which fell in an earthquake in 1275. Traditionally the tor was the site of a very early wattle chapel built by Joseph of Arimathea, who is said to have landed at Glastonbury (then surrounded by water) after the crucifixion of Jesus. The tor has been the scene of some mysterious light phenomena in recent years. In 1981 people climbing the tor saw a strange writhing light, which arced from the tower and earthed itself near to Chalice Well. The earth mysteries researcher Paul Devereux also witnessed strange lights in 1991. St Michael's Mount is said to be the starting point for the infamous St Michael's ley, a broad line linking the Mount, St Michael's Church Brentor, St Michael's Church Burrowbridge, St Michael's Church Othery, St Michael's Church, Glastonbury Tor and Stoke St Michael. Although too short a space to elaborate on, this can really only be seen as modern folklore. With some 900 years of history behind it, it would almost be a surprise if Edinburgh Castle wasn't one of Scotland's most haunted sites. Since its construction as a military fortress in the early 12th century, the castle has witnessed surprise attacks, executions, and even a brief capture by the English. Reincarnated as a tourist attraction, Edinburgh Castle now offers haunted tours of its dungeons, which once hosted the likes of Duke Alexander Stewart of Albany (who escaped, stabbing his guards to death and then burning their bodies), Lady Janet Douglas of Glamis (accused of witchcraft and burned at the stake), and an unnamed piper who once wandered down one of the castle's underground passages and never returned. In 2001, Edinburgh Castle became the site of the one of the largest paranormal investigations in history. A team of nine researchers and over 200 members of the public explored the castle's forgotten chambers and secret passages for signs of ghostly happenings. The public was not told which areas of the castle were rumored to be haunted and which were not. 51% of participants in haunted areas reported paranormal experiences, while only 35% did so in the non-haunted areas. Shadowy figures, sudden drops in temperature and the feeling of something tugging on your clothes are all everyday experiences in Edinburgh. If the castle's paranormal activity isn't enough, Edinburgh also boasts the Mary Kings Close, an underground area of the city in which victims of the Black Plague were quarantined and left to die. Nestling amidst the foothills of the Slieve Bloom Mountains, the gothic revival Kinnitty Castle has had a long and turbulent history. The first stronghold built on the site, was destroyed in 1209 and rebuilt by the Norman’s in 1213. In time it came into the possession of the powerful O’Carrolls of Ely. In 1630 one of their line, William O’Carroll, built a new fortress, which was confiscated by the English. In 1664 the estate was granted to Colonel Thomas Winter, as a reward for his military service and, two hundred years later, his descendents sold it to the Bernard family. In 1811 Lady Catherine Hutchinson, wife of Thomas Bernard commissioned the present castle which, although burnt by the Republican’s in 1922, was restored and has since been transformed into the magnificent, extremely cosy, hotel whose, dark, atmospheric corridors; elegant rooms; library bar resplendent with rows of antique books upon its shelves; and sweeping stairways, provide visitors with tranquil haven far removed from the stresses and strains of the modern world. Still in existence in the extensive grounds are the remains an Augustinian Abbey, and an ancient Celtic High Cross, carved with depictions of the presentation in the Temple and the crucifixion, together with Adam and Eve and intertwining birds. It would also appear that one of the long-dead monks from the old foundation finds the ambience of the castle more than congenial, choosing to wander the darker recesses of the banqueting room where delights in revealing future events, linked with the everyday business of the hotel, to one particular member of staff who often astonishes the owner with the accuracy of the prophecies! A sense of genuine antiquity prevails over the sylvan landscape that cradles Ireland’s most enigmatic and impressive Gothic revival castles in a protective embrace. It is approached via a long and pitted drive that meanders through sinister tunnels of massive oaks whose crook-necked shadows dance before you, their writhing forms beckoning you onwards. Then, as your nebulous escorts fall suddenly away, you find yourself confronted by an awesome vision of breathtaking splendour as unyielding walls, punctured by mullioned windows and crowned by towering turrets, loom gracefully over you. Built between 1798 and 1812 by Charles William Bury (1764-1835), the first Earl of Charleville, and designed by Francis Johnston, Charleville Forest Castle is a proud testimony to Johnston’s vision and the sheer extravagance - unhindered by the constraints of their purse strings - with which successive generations of the Charleville family enthusiastically embraced life. Every so often, the pressure of living beyond their means would necessitate the temporary closure of the castle, although subsequent re-openings would often be marked by a suitably flamboyant gesture, such as engaging the talents of William Morris, much of whose exquisite dining room ceiling work, amazingly, still survives. But the family’s inability to curb their excesses sounded the castle’s death knell, and periods of occupancy became more intermittent until, by the early 1960’s, it had been all but abandoned. It is now owned by Bridget Vance – a charismatic American - who is slowly rousing the castle from its slumber and, with the aid of local craftsmen, restoring its echoing rooms to their past grandeur. But, as her family go about their task, the spirits of bygone residents have begun to stir, and an abundance of ghosts now wander the what has recently been dubbed "Ireland’s spookiest castle." The silence of the early hours is sometimes shattered by the playful whoops of children, enjoying a phantom game in what was once the nursery. It may be these same children who were responsible for once locking Bridget’s daughter, Kate, in a dark cupboard in their playroom. Older revenants appear to have been to blame for disturbing Richard Hayes who, following a party at the castle, placed his bedroll on the floor and settled down to sleep. Next morning, the children asked Bridget why he had slept with the door open and the lights on? He told her that, just as he was nodding off, two elderly English Men - who, from the style of their speech, were evidently of another era – had struck up an animated conversation, interspersed with the downing of copious amounts of alcohol and, although he could hear them close-by, he could not see them! I too experienced an unexplainable occurrence when I visited the castle. I was talking with Kate Vance, who asked me if I had ever seen a ghost. Just as I began to answer, the huge chandelier above our heads suddenly switched on and, at the same moment, a radio in the room next door – which was definitely empty at the time – began blaring out classical music. The wraiths of both Charles William Bury and Francis Johnston have also been seen here. One morning, at around 3am, Bonnie Vance, awoke to find them leading a ghostly cavalcade across her bedroom in the tower. It consisted of a woman in a black hood, a little girl and a group of around seventeen "monks or druids" who encircled her bed and appeared to bestow a blessing upon her. But the most poignant of all the spectres that walk this most haunting and atmospheric of castles, is that of the little girl in a blue chiffon dress, whose shimmering shade has been seen many times on the great, winding staircase, the faded walls and creaking boards of which are imbued with a decidedly chilling aura. Her name in life was Harriet, and one day she was sent upstairs to wash her hands. Having done so, she was playfully sliding down the balustrade when she suddenly lost her balance and plunged to her death on the floor below. Many people, walking down the staircase where the tragedy occurred, have frequently felt the cold draught of her invisible presence as she brushes past them, whilst others have seen her phantom form, skipping playfully in front of them. The ghost of a small boy occasionally joins her and once, when he was around three years old, Bridget’s son went missing. Fearful of the steep stairs and precarious drops around the property, the family began an anxious search. They eventually found him at the bottom of the stairwell where he told how "the little boy and girl" had looked after him as he came down the stairs. Charleville Forest Castle is a special place and, despite the abundance of ghosts that roam its corridors; you leave it with a sense of sheer wonder. It is a welcoming place whose spectral residents are, on the whole, friendly. But, as you make your way back along the driveway, you come upon an ancient reminder of the castles more sinister past. Towering over you, its lower branches almost touching the road, is the prodigious "King Oak" the massive girth of which testifies to its venerable age. Yet its majestic splendour is tinged with a fearsome reputation, for it was always maintained that, whenever one of its branches fell, a member of the Charleville family would die. In May 1963, a huge bolt of lightning smashed into it and shattered its trunk from top to bottom. Although the oak survived, relief was muted when, two weeks later, Colonel Charles Howard-Bury, the head of the family and the last of the line to own the castle, suddenly dropped dead. The Brown Mountain Lights are a series of ghost lights reported near Brown Mountain in North Carolina. The lights can be seen from the Blue Ridge Parkway overlooks at mile posts 310 (Brown Mountain Light overlook) and 301 (Green Mountain overlook) and from the Brown Mountain Overlook on NC Highway 181 between Morganton, NC and Linville, NC. Additionally, good sightings of the Lights have been reported from the top of Table Rock, outside of Morganton, NC. One of the best vantage points, Wisemans View, is about 4 miles from Linville Falls, NC. There is also a Brown Mountain Overlook on North Carolina Highway 181 that was recently improved with help from the city of Morganton for the purpose of attracting those who visit the area to see the lights. The best time of year to see them is reportedly September through early November. Hermitage Castle was supposedly built by one Nicholas de Soulis around 1240, in a typical Norman Motte and Bailey pattern. It stayed in his family until approximately 1320, when his descendant, William de Soulis forfeited it because of suspected witchcraft and the attempted regicide of King Robert I of Scotland. As the familiar of Lord William de Soulis, a certain Robin Redcap wrought much harm and ruin in the lands of his master's dwelling, Hermitage Castle. Ultimately, he was taken to the Nine Stane Rigg, a circle of stones hard by the castle, wrapped in lead, and boiled to death. The Catacombs entry is in the western pavilion of Paris's former Barrière d'Enfer city gate. After descending a narrow spiral stone stairwell of 19 meters to the darkness and silence broken only by the gurgling of a hidden aqueduct channeling local springs away from the area, and after passing through a long (about 1.5 km) and twisting hallway of mortared stone, visitors find themselves before a sculpture that existed from a time before this part of the mines became an ossuary, a model of France's Port-Mahon fortress created by a former Quarry Inspector. Soon after, they would find themselves before a stone portal, the ossuary entry, with the inscription Arrête! C'est ici l'empire de la Mort ('Stop! Here lies the Empire of Death"). Located at the Rochester Historical Society is the table the Fox Sister used for their seances. Much like when they were girls, the Fox Sisters relied on mysterious "rappings" as proof that spirits were present. This table was specifically made to produce these rappings. Within the enclosed top of the table, lies a spring connected to a long metal rod. When pushed, the rod hits the inside of the table, creating the rapping sound. The sisters were also known to create unusual sounds by cracking their feet and knuckles, which they used as further evidence that the dead was present. The Fox Sisters' ability to communicate with the dead was hoax. The Fox Sisters continued to perform seances and other matters of spirit communication until the late 1800s when skeptics and nonbelievers forced them to admit it was all a fraud. Chief among these skeptics was the magician Harry Houdini, who took it personally that these sisters were defrauding vulnerable people. With their livelihood ruined, the Fox Sisters faded into alcoholism and obscurity. By the turn of the century, all of the sisters had died in poverty and shame. "Bennington Triangle" is a nickname given by paranormal author Joseph A. Citro to denote an area of southwestern Vermont within which at least five or as many as ten people have disappeared between 1920 and 1950.This "mystery triangle" centered around Glastenbury Mountain and includes some or most of the area of the towns immediately surrounding it, especially Bennington, Woodford, Shaftsbury, and Somerset. Glastenbury and its neighboring township Somerset were both once moderately thriving logging and industrial towns, but began declining toward the late 19th century and are now essentially ghost towns, unincorporated by an act of the state legislature in 1937. The Bennington Triangle also has been a hotspot for UFO activity, Big Foot sightings, and strange lights and sounds. Other sources do seem to support that such folklore does appear to date back as far as the late 19th century. This includes the local folk belief that Native Americans regarded the Glastenbury area as "cursed" and avoided it, as well as tales of hairy "wild men" and other strange beasts in the woods. Such is the story as it appears in Frank Edwards's 1959 book Stranger than Science; other versions appear in Whitley Strieber's science fiction novel Majestic (fiction) and Dean Koontz's horror yarn "Phantoms". The World's Greatest UFO Mysteries (presented as fact) has an even more detailed version, as do other websites and books, adding other standard details such as mysterious lights in the sky, empty graveyards, and over a thousand people missing. The earliest version of the story is found in the November 27, 1930, Danville Bee, written by journalist Emmett E Kelleher. That article contained a "photo" that was later found to be from 1909 and had nothing at all to do with the story. The incident appears to have been forgotten until referenced by Edwards's 1966 book. The RCMP has since dismissed the case as an urban legend, claiming that the story originated in Frank Edwards' book. The RCMP also states, "It is also believed that such a large village would never have been possible in such a remote area" (despite the fact that the aforementioned book the RCMP references mentions just 30 people and one grave). The RCMP states that it has no record of any unusual activity in the area. The legend of the Lost Dutchman's Gold Mine centers around the Superstition Mountains. According to the legend, a German immigrant named Jacob Waitz discovered a mother lode in the Superstition Wilderness and revealed its location on his deathbed in Phoenix in 1891 to Julia Thomas, a boarding-house owner who had taken care of him for many years. Several mines have been claimed to be the actual mine that Waitz discovered, but none of those claims have been verified. Some Apaches believe that the hole leading down into the lower world is located in the Superstition Mountains. Winds blowing from the hole are supposed to be the cause of severe dust storms. The Morbid Anatomy Library and Cabinet, a research library and private collection available to the interested public. The library/cabinet makes available a collection of books and catalogs, photographs, fine art, taxidermy, ephemera, and artifacts relating to medical museums, anatomical art, collectors and collecting, cabinets of curiosity, the history of medicine, death and society, natural history, arcane media, and curiosity and curiosities broadly considered. In the heart of Togo's capital, Lome, is a market dedicated to the sale of ingredients which traditional healers say can make magic charms. People who practise the voodoo tradition believe that life derives from the natural forces of earth, water, fire and air. Joseph, a healer from neighbouring Benin, says: "This place is like a pharmacy for everybody in the world. When someone has a serious sickness and the hospital cannot help, they come here to the fetish market." There are a thousand ghost towns spread across the western United States -- a whole constellation of loss and ruin -- but most are little more than foundations, or at best a few tumbledown shacks, or if the people who lived and died there did anything of note, and if they're lucky, a sun-faded commemorative plaque mounted on a squat stone pillar. The ghost town of Bodie, however, is another story altogether. A mining boomtown, it was the third most populous city in the state of California in 1880. By the 1940s sickness, wars, bad weather and exhausted mines had led to the town's desertion, and its isolated, inhospitable location made certain that it stayed that way. Designed and built by BAE Advanced Technologies (BAEAT), its purpose is to analyze the ionosphere and investigate the potential for developing ionospheric enhancement technology for radio communications and surveillance. The HAARP program operates a major sub-arctic facility, named the HAARP Research Station, on an Air Force–owned site near Gakona, Alaska. Nick Begich Jr., the son of former U.S. Representative Nick Begich and author of Angels Don't Play This HAARP, has claimed that HAARP could trigger earthquakes and turn the upper atmosphere into a giant lens so that "the sky would literally appear to burn", and maintains a website that claims HAARP is a mind control device. Former Governor of Minnesota and noted conspiracy theorist Jesse Ventura questioned whether the government is using the site to manipulate the weather or to bombard people with mind-controlling radio waves. An Air Force spokeswoman said Ventura made an official request to visit the research station but was rejected-"he and his crew showed up at HAARP anyway and were denied access". According to local legend, the founders of Dudleytown were descended from Edmund Dudley, an English nobleman who was beheaded for treason during the reign of Henry VII. From that moment on, the Dudley family was placed under a curse, which followed them across the Atlantic to America. Several residents of Dudleytown are said to have gone insane, and two local women, Mary Cheney and Harriet Clarke, are said to have committed suicide, the latter having reported visions of demons prior to her death. However, this version of events is much disputed, and a number of factual inaccuracies have been highlighted by local authors and historians. For instance, there is no evidence of a genealogical link between the founders of Dudleytown and the nobleman Edmund Dudley; Mary Cheney, who had in fact never set foot in Dudleytown, did not kill herself but died of lung disease; Harriet Clarke did commit suicide, but in New York, not Dudleytown; and most of the cases of "insanity" were more likely senility brought on by old age. The real reason for the town's desertion may be that it was built too far from a source of clean water, and on land that was not suited to cultivation. It has also been speculated that the groundwater in the area was contamined with lead. The Hoia-Baciu Forest is located near Cluj-Napoca, Romania and is locally referred to as the Bermuda Triangle of Romania. Hoia Baciu Forest, has a reputation for paranormal activity. Reports have included, among others, folk ghost stories, apparitions, faces identified in photographs that were not visible with the naked eye, and, in the 1970s, UFO sightings. Visitors to the forest report anxiety and the feeling of being watched, and the local vegetation is oftentimes bizarre (strangely shaped trees, charring on tree stumps and branches). The forest was named after a shepherd that disappeared in the area with two hundred sheep. Most people who live near the forest are afraid to enter. They believe that those who visit the site will never return. Many of the locals who have gone into the forest complain of physical harm, including rashes, nausea, vomiting, migraines, burns, scratches, anxiety, and other unusual bodily sensations. Another story of the The Hoia-Baciu Forest is the site of strange paranormal phenomena which have been recorded and researched for nearly 50 years. The woods are thought to be notoriously haunted by the Romanian peasants who were murdered here. It is believed that the souls of these ghosts are trapped within the wooded confines of Hoia-Baciu and that the ghosts are enraged by their predicament. Within the dark interior, people have been known to disappear, strange lights have been seen, the wind seems to speak, and visions of these tormented spirits are observed by terrified travelers. Pairs of green eyes and a black fog have been observed here and many people report a feeling of being watched as they travel near the forest’s edge. Locals also believe that there is a hub for this paranormal activity— a circular plateau deep in the forest which is devoid of trees and which is thought to be the “home” of these ghosts. Photos taken here have been developed to reveal hovering shapes and outlines of human forms. More recently the paranormal energy of the forest has taking on the form of poltergeist and ghost activity. In one paranormal television series an investigator in the forest is scratched and thrown on the ground. People also claim to see bright lights within the woods. This paranormal activity seems to be focused in an inexplicable clearing in the forest that is a vegetation dead zone. It is nearly a perfect circle in the woods where nothing will grow. Soil samples have been taken from the site and analyzed but results show that there is nothing in the soil that should prevent the growth of plant life. UFOS, a dead vegetation zone, lights with no logical source, poltergeist activity, EVP activity, and malfunctioning electronics are the documented paranormal happenings of this creepy forest. While most of the stories about this legendary location may be over exaggerated, it is hard to ignore the fact that something is going on in this forest that we may not understand given the recent well-documented occurrences of poltergeist activity. There are many people who say that in this place there are paranormal phenomena or appearances of UFOs, one mysterious place near Cluj Napoca, Baciu Forest begins to compete more and more with the Dracula legend in Transylvania… This is a forest just a few miles from Cluj, who became famous because of unexplained phenomena, which are considered by some as manifestations of the paranormal. This forest’s fame spread worldwide. Prestigious publications such as Travel & Leisure magazine or BBC have included this among the most interesting forest haunted areas on the planet. And his fame continues to attract tourists. Two years ago, the famous actor Nicolas Cage, who was shooting a film in Sibiu, came to Cluj specifically to see this mysterious forest. What is actually Baciului Forest? Forest, which covers an area of ​​over 250 hectares, it attracts many amateurs of Yoga, Wicca and the paranormal. There are numerous legends in connection with this forest. Some trees grew crooked and that is why there is speculation that their shape was influenced by mysterious energies. There are people who believe that in this forest there is portal that provides access to other universes. There are also legends that entities outside world would occur here every year. "The grand buildings and elegant gardens of McMenamins Edgefield don’t leave one with the impression of anything less than opulence, but look a little deeper into the property’s past and you might find something that gives you the chills." The hotel and grounds are absolutely gorgeous and makes for wandering around that much more fun. The log of supernatural experiences is a most read as a good reference for hotspots around the property. Over 97 years ago, long before serial killers and mass murders had become a way of life, two adults and 6 children were found brutally murdered in their beds in the small mid-western town of Villisca, Iowa. During the weeks that followed, life in this small town changed drastically. As residents of this small town reinforced locks, openly carried weapons and huddled together while sleeping, newspaper reporters and private detectives flooded the streets. Accusations, rumors and suspicion ran rampant among friends and families. Bloodhounds were brought in. Law enforcement agencies from neighboring counties and states joined forces. Hundreds of interviews filled thousands of pages. And yet, the murders remained unsolved, the murderer unpunished. Called "the perfect place to die," the Aokigahara forest has the unfortunate distinction as the world's second most popular place to take one's life. (The first is the Golden Gate Bridge.) Since the 1950s, Japanese businessmen have wandered in, and at least 500 of them haven't wandered out, at an increasing rate of between 10 and 30 per year. Recently these numbers have increased even more, with a record 78 suicides in 2002. Japanese spiritualists believe that the suicides committed in the forest have permeated Aokigahara's trees, generating paranormal activity and preventing many who enter from escaping the forest's depths. Complicating matters further is the common experience of compasses being rendered useless by the rich deposits of magnetic iron in the area's volcanic soil. Locals say they can easily spot the three types of visitors to the forest: trekkers interested in scenic vistas of Mount Fuji, the curious hoping for a glimpse of the macabre, and those souls who don’t plan on returning. What those hoping to take their lives may not consider is the impact the suicides have on the locals and forest workers. In the words of one local man, "It bugs the hell out of me that the area's famous for being a suicide spot." And a local police officer said, "I've seen plenty of bodies that have been really badly decomposed, or been picked at by wild animals... There's nothing beautiful about dying in there." The forest workers have it even worse than the police. The workers must carry the bodies down from the forest to the local station, where the bodies are put in a special room used specifically to house suicide corpses. The forest workers then play jan-ken-pon—which English-speakers call rock, paper, scissors—to see who has to sleep in the room with the corpse. It is believed that if the corpse is left alone, it is very bad luck for the yurei (ghost) of the suicide victims. Their spirits are said to scream through the night, and their bodies will move on their own. In the early 20th century, a small office built for a local mining company began sliding down a hill, eventually resting at an odd angle to its foundation. From this simple accident a tourist attraction was born. The owners, the Cooper family, say the building slid down the hill because of a magnetic force, that forms what the Coopers call a "vortex." This force, they claim, also causes all sorts of other "paranormal activity" around the hill, where balls appear to roll uphill and broomsticks seem to stand on end. The Cooper family also claims that the Native Americans thought this space was forbidden ground, and their horses would not enter it, though local Native Americans may say otherwise. Skeptics, and those with a good pair of eyes or sense of orientation, will point out that it is the distorted building that makes the objects and people around it appear at different heights. The perceived distortions are due to a forced perspective which makes shapes appear larger or smaller due to a distorted background. A classic example of this is an Ames room in which people appear to grow in size as they walk across it. Magnetic vortex: probably not. Delightful trick of perception: unquestionably. The quietest place on Earth is a room in Minneapolis, Minnesota, and the longest anyone has stayed in the dark there is 45 minutes. The 'anechoic chamber' at Orfield Laboratories absorbs over 99 percent of sound with 3-foot-thick fiberglass wedges and insulated walls, removing virtually every sound except that of people and objects brought into the chamber. In some cases, that's used for simple industrial purposes: it's a way to hear the sounds of switches, motors, or washing machines without outside interference. Put a human being in there, however, and they become disoriented or even experience hallucinations. After a few minutes, founder Steven Orfield told the Daily Mail, your body begins to adapt to the soundlessness, picking up smaller and smaller sounds. "You'll hear your heart beating, sometimes you can hear your lungs, hear your stomach gurgling loudly. In the anechoic chamber, you become the sound." Because there are no external sounds, it's difficult to move around: "If you're in there for half an hour, you have to be in a chair." In extreme cases, the sensory deprivation is debilitating. NASA astronauts train by being placed in a water tank in the room, an experience that apparently causes hallucinations as the body tries to create sensations out of thin air. When the lights are turned out, the Mail says that the longest time anyone has been able to stay inside is 45 minutes. At Orfield, it seems, the greatest distraction of all is not noise but silence. Momo is the name of a local legend, similar to the Bigfoot, which is reported to live in Missouri. The name Momo is short for 'Missouri Monster' and it is reported to have a large, pumpkin-shaped head, with a furry body, and hair covering the eyes. First reported in July 1971, near Louisiana, Missouriby Joan Mills and Mary Ryan, Momo has been spotted up and down the Mississippi River. It is supposedly a large, 7 ft (2.1 m) tall, hairy, black, manlike creature that eats dogs and emits a terrible odor. Some suggest it was a rogue black bear. Following sightings in 1972 beginning at 3:30 p.m. July 11, first reported by Terry, Wally, and Doris Harrison, and lasting for about 2 weeks, tracks were found and submitted to Lawrence Curtis, director of the Oklahoma City Zoo and Botanical Garden. The Muldjewangk is a water-creature in Australian Aboriginal mythology that inhabited the Murray River, particularly Lake Alexandrina. It was used as a deterrent for Aboriginal children who wished to play near the riverside after dark. Sometimes they are portrayed as evil merfolk (half man half fish), or times as a gargantuan monster. It is also inconsistent whether there are many of the creatures, or a single "The Muldjewangk". A legend tells of a monstrous Muldjewangk who once attacked a steamboat owned by European settlers. The captain saw two great hands grasping the hull of the boat so he grabbed his gun. Aboriginal elders on board warned the captain not to shoot, but their pleas fell on deaf ears. "You're going to suffer now" they warned. Soon later, the captain suffered from weeping red blisters all over his body, and took six months to die. The Muldjewangk pesters Ngurunderi (see Murray River) and his wives when they settle on the banks of Lake Alexandrina by wrecking their fishing nets. Large clumps of floating seaweed are said to hide Muldjewangks and are to be avoided. Large footprints have also been seen. Some elders now say the Muldjewangks no longer inhabit the river system. And he says he has hundreds of reports to prove it - detailed sightings of the creature collected by himself and his wife Heather over the last 30 years, the most recent in November 2000. "In recent years there have been sightings of creatures surfacing as far up as Windsor," Rex said. "The latest was in the St Albans where there was a report of a 25-30 foot creature spotted swimming in the river. Some people who had been out fishing saw it swimming past the jetty where they were standing, with a snake-like head about a metre or so above water." Descriptions of the Hawkesbury Monster liken it to the prehistoric plesiosaur, an aquatic dinosaur 70 million years extinct. According to the 57-year-old naturalist, stories about the creatures in Australia date back to before the first white settlers and are a part of Aboriginal folklore. Early settlers to the area during the 1800s were told stories by Aboriginals of women and children being attacked by the moolyewonk or mirreeular, the Aboriginal names for the monster, Rex said. "Information collected so far suggests to me that the creatures are breeding somewhere offshore and laying their eggs inland. This would not be out of character, as there were both freshwater and saltwater breeds during the Cretaceous period," he said. "They are still being seen in the Hawkesbury River of course, which is not surprising because it is such a deep river. Actually it's a sunken valley." Sightings put the greyish black creature between 7 and 24 metres in length. At the top end of the scale that's about five times bigger than a great white shark or the equivalent length of five commodores parked bumper to bumper. Like Nessie, which cryptozoologists also believe to be a plesiosaur, the Hawkesbury River monster has a large body, two sets of flippers and a long snakelike neck and head. "Aboriginal rock art in the area 3-4000 years old describes the creature as about 20 foot long. The Aborigines were pretty observant and this carving means those creatures were seen around the Hawkesbury River," Rex said. Reports of sea monsters can be found across the Pacific and around the globe, the most famous and enduring of which is Scotland's Loch Ness Monster. Rex said new species, as well as those previously thought to be extinct, were being constantly discovered and scientists should be more broadminded in their research. "It seems to me that we do have a race of creatures that are officially extinct, yet they are still with us," Rex said. "As to what it is? I believe it's a marine reptile of some sort that scientists should really start taking an interest in. We've got a lot going on in our own backyard and Australians should be investigating." The Brocken has always played a role in legends and has been connected with witches and devils; Johann Wolfgang von Goethe took up the legends in his play Faust. A Brocken spectre (German Brockengespenst), also called Brocken bow, mountain spectre or glockenspectre is the apparently enormous and magnified shadow of an observer, cast upon the upper surfaces of clouds opposite the sun. The phenomenon can appear on any misty mountainside or cloud bank, or even from an aeroplane, but the frequent fogs and low-altitude accessibility of the Brocken, a peak in the Harz Mountains in Germany, have created a local legend from which the phenomenon draws its name. The Brocken spectre was observed and described by Johann Silberschlag in 1780, and has since been recorded often in literature about the region. Mussie is an alleged sea monster reported to be living in Muskrat Lake, 75 miles (121 km) northwest of Ottawa, Ontario, the capital of Canada. The legend has gone a through a gradual image change over the years. In the past the creature was classified as a "hepaxalor" and described as a great serpent with three eyes and sharp teeth that towered over its potential prey. However, the interest of several "Mussie enthusiasts" of various professional grades has helped to organize witness accounts and streamline the modern perception of Mussie that appears less exaggerated. It is now most popularly imagined as an unknown type of marine mammal, sharing traits with a seal or walrus. Local folklore says that while exploring the region over 300 years ago, Samuel de Champlain learned from the natives of the area of a legendary creature that lived in the lake. Though the legend may certainly descend from native lore, no mention is given of it in Champlain's memoirs. Nevertheless, the myth survived with help from a sign which once welcomed visitors to Cobden. The sign featured Champlain holding his famous lost astrolabe while looking out over Muskrat Lake. In the lake, prominently displayed, is Mussie, depicted as having three eyes and a long tongue. The sign is inaccurate in many ways, least of all in giving the impression that Champlain had actually encountered the creature. Though the sign has been replaced, its impact is still felt. Champlain is still the traditional starting point for any Mussie tale. Tahoe Tessie is a cryptozoological creature which supposedly resides in North America's largest alpine lake, Lake Tahoe, located in Nevada andCalifornia. Tales of the lake-dwelling creature can be traced to stories told by members of the Washoe and Paiute tribes in the mid-19th century, stating that the creature resides in an underwater tunnel beneath Cave Rock, and sightings have continued into modern day. The Loveland Frog (otherwise known as the Loveland Lizard) is said to be a humanoid creature with the face of a frog and is described as standing roughly 4 feet (1.2 m) tall with green leathery skin. It walks upright and has webbed hands and feet, and was allegedly first spotted inLoveland, Ohio. Editor's Note: It is unclear if this is a private home or if they allow visitors. The Kansas Parnaormal Group has extensively researched and investigated the Sallie House over the years and may be primarily responsible for labeling the haunting as "probably demonic" because of the many violent incidents. The house continues to be a focal point for investigations by ghost hunting groups from all over the country, who report strange activity, EVP, and other phenomena. On Friday the 13th, 2012, a72-hour investigation was broadcast live on the internet, the replay of which you can find here. Montgomery Clift's ghost is thought to haunt room 928, where he stayed whilte filming From Here to Eternity, and can still be heard playing his trumpet. His spirit has also been spotted on the eighth floor. Former Saturday Night Live cast member Ana Gasteyer, while staying one of the hotels's suites, encountered a piano that played by itself and the full-body apparition of a maid in a hall closet. Brief history: During Prohibition in the 1920s, the Moss Beach Distillery in Moss Beach, California became one of the most popular speakeasies on the West Coast when it was known as "Frank's Place," frequented by silent film stars drinking its illegal booze. After Prohibition, the place continued as a successful restaurant, which it remains today. Ghosts: The Blue Lady is the Distillery's most famous ghost and has been investigated by such prominent ghost hunters as Loyd Auerbach as well as the Unsolved Mysteries TV show. According to legend, in the 1930s a beautiful young woman, possibly named Cayte, fell for a piano player of questionable character and they began an affair, even though she was already married. She was killed by an unknown assailant on the nearby beach, and it is thought that her spirit -- dressed in blue -- still searches for her lover. Built in 1796 by General David Bradford, this stately old home on Myrtles Plantation is said to be haunted be several restless ghosts. Some researchers say as many as ten murders have been committed there, but others, such as Troy Taylor and David Wisehart, have only been able to confirm one murder at Myrtles. (Those two authors provide a very good history of the house in their article, The Legends, Lore & Lies of The Myrtles Plantation). Lily Dale is a spiritualist community of the Modern Spiritualist movement located in Chautauqua County, New York, USA. Lily Dale became renowned for Spiritualism when members moved the home of its American founders, Kate and Margaret Fox, to the town after it was purchased in 1927. Lily Dale is a hamlet located in the Town of Pomfret on the east side of Cassadaga Lake, next to the Village of Cassadaga. Located in southwestern New York State, it is one hour south of Buffalo, halfway to the Pennsylvania border. Lily Dale's year-round population is estimated to be 275. Each year approximately 22,000 registered visitors come for classes, workshops, public church services and mediumship demonstrations, lectures, and private appointments with mediums. This grand old ship is quite haunted, according to the many people who have worked on and visited the craft. Once a celebrated luxury ocean liner, when it ended its sailing days the Queen Mary was purchased by the city of Long Beach, California in 1967 and transformed into a hotel. A remarkable occurrence, which attracted wide-spread interest, was connected with the family of John Bell, who settled near what is now Adams Station about 1804. So great was the excitement that people came from hundreds of miles around to witness the manifestations of what was popularly known as the "Bell Witch." This witch was supposed to be some spiritual being having the voice and attributes of a woman. It was invisible to the eye, yet it would hold conversation and even shake hands with certain individuals. The feats it performed were wonderful and seemingly designed to annoy the family. It would take the sugar from the bowls, spill the milk, take the quilts from the beds, slap and pinch the children, and then laugh at the discomfort of its victims. At first it was supposed to be a good spirit, but its subsequent acts, together with the curses with which it supplemented its remarks, proved the contrary. Roswell has benefited from interest in the alleged UFO incident of 1947. It was the report of an object that crashed in the general vicinity in June or July 1947, allegedly an extraterrestrial spacecraft and its alien occupants. Since the late 1970s the incident has been the subject of intense controversy and of conspiracy theories as to the true nature of the object that crashed. The United States Armed Forces maintains that what was recovered was debris from an experimental high-altitude helium weather and surveillance balloon belonging to a classified program named "Mogul" however, many UFO proponents maintain that an alien craft was found and its occupants were captured, and that the military then engaged in a cover-up. In recent times, the business community has deliberately sought out tourists interested in UFOs, science fiction, and aliens. Centralia is a borough and a near ghost town in Columbia County, Pennsylvania, United States. Its population has dwindled from over 1,000 residents in 1981 to 10 in 2010, as a result of a mine fire burning beneath the borough since 1962. Centralia is one of the least-populated municipalities in Pennsylvania. A ranch in the backwoods of Washington state were I've witnessed unidentified flying objects in the night sky. Though I've yet to encounter an extraterrestrial,I have witnessed flight patterns not related to any satellites or aircrafts of the norm, and triangular shaped lights. Sightings were observably consistent after 10PM. Closed permanently in 1966, the ruins and caves can still be explored. There are stories of sacrifices, and screams can be heard in the abandoned caves and tunnels. Sutro Baths is more of a place to hike and do a bit of urban exploration. Due to the terrain, it's not the safest area to conduct a paranormal investigation. Numerous sightings and experiences reported by staff,vendors and customers. Harvey's resides in the early 1900's constructed Bastian Building, formally a hotel and brothel. The main entryways to other businesses are closed off, but several Shanghai tunnel passageways make the basement of the building. Sightings include: shadow people, an African American male, a woman dressed in an 80's era suit, male dressed in 1920's attire. Most of what's experienced are feelings of not being alone, footsteps, bar stools knocked to the ground, and voices. Most believe the tunnels are still being used in the afterlife, explaining the variety of sightings and paranormal experiences especially in areas directly above the tunnels. In doing research and piecing personal accounts, we believe we found the connection to the woman in the 80's era suit. This woman is always seen looking through banker boxes in the basement, which are the property of our law office neighbors above. Either a dedicated worker or a formal client, we've yet to figure that out. Reputedly, one of the more haunted locations in Gettysburg. Pleasant staff and a great séance room next door. I witnessed a black cloaked entity with blonde hair, a slight lean, and most peculiarly, no face. It ‘stood’ approximately 6.5′ tall and remained visible for roughly 5 seconds. Further research found a name for the being, 'The Gatekeeper'. Ghosts, voodoo, and vampires. If that isn't enough to get you wanting a trip out there, the promise of café au lait and beignets should put you over the top. Many believe the Stanley Hotel is haunted, having reported a number of cases of ghostly activity, primarily in the ballroom. Kitchen staff have reported to have heard a party going on in the ballroom, only to find it empty. People in the lobby have allegedly heard someone playing the ballroom's piano; employees investigating the music purportedly found nobody sitting at the piano. Employees believe that particular ghost is of Freelan O. Stanley's wife, Flora, who used to be a piano player. In one guest room, people claim to have seen a man standing over the bed before running into the closet. This same apparition is allegedly responsible for stealing guests' jewelry, watches, and luggage. Others reported to have seen ghosts in their rooms in the middle of the night, simply standing in their room before disappearing. It is located in the southern portion of Nevada in the western United States, 83 miles (133 km) north-northwest of Las Vegas. Situated at its center, on the southern shore of Groom Lake, is a large military airfield. The base's current primary purpose is officially undetermined; however, based on historical evidence, it most likely supports development and testing of experimental aircraft and weapons systems. The intense secrecy surrounding the base has made it the frequent subject of conspiracy theories and a central component to unidentified flying object (UFO) folklore. Although the base has never been declared a secret base, all researches and occurings in Area 51 are Top Secret/Sensitive Compartmented Information (TS/SCI). Wardenclyffe Tower (1901–1917) also known as the Tesla Tower, was an early wireless transmission tower designed by Nikola Tesla in Shoreham, New York and intended for commercial trans-Atlantic wireless telephony, broadcasting, and proof-of-concept demonstrations of wireless power transmission. Coral Castle is a stone structure created by the Latvian American eccentric Edward Leedskalnin (1887–1951) north of the city of Homestead, Florida in Miami-Dade County at the intersection of South Dixie Highway (U.S. 1) and SW 157th Avenue. The structure comprises numerousmegalithic stones (mostly limestone formed from coral), each weighing several tons. It currently serves as a privately operated tourist attraction. Coral Castle is noted for legends surrounding its creation that claim it was built single-handedly by Leedskalnin using reverse magnetism and/orsupernatural abilities to move and carve numerous stones weighing many tons. The Winchester Mystery House in San Jose is supposedly haunted by the ghost of its eccentric builder, Sarah Winchester. Ironically, she is said to have built the rambling mansion to protect her from the spirits of all those killed with her late husband's famous line of rifles. The Shangai tunnels located in Portland are part of an underground city located in the Old Town/Chinatown district. The tunnels were often used during prohibition, as well as to kidnap and smuggle immigrants, laborers, and prostitutes who would be sold to ship captains passing through on the Willamette River. The tunnels are reportedly the most haunted place in the city of Portland. The Ohio State Reformatory in Mansfield is a defunct prison that was shut down in 1990. Now, people report cell doors slamming, yelling, physical attacks on women, and shadow figures. According to local legend, Skinwalker Ranch, also known as Sherman Ranch, is a property located on approximately 480 acres (1.9 km2) southeast of Ballard, Utah that is allegedly the site ofparanormal and UFO-related activities. Its name is taken from the skin-walker of Native American legend. Claims about the ranch first appeared in the Salt Lake City, Utah Deseret News, and later in the alternative weekly Las Vegas Mercury as a series of articles by journalist George Knapp. Knapp and co-author Colm Kelleher subsequently authored a book in which they describe the ranch being acquired by the National Institute for Discovery Science (NIDSci) to study anecdotal sightings of UFOs, bigfoot-like creatures, crop circles, glowing orbs and poltergeist activity reported by its former owners. Eastern State Penitentiary is reported to have apparitions, perhaps hundreds, walk its corridors. Infamous resident Al Capone was said to be haunted by the ghost of James Clark, slain under orders of Capone in the Saint Valentine's Day massacre. The guard tower is reputed to be haunted by the ghost of a guard. Cell Block 12 is credited as the site's most haunted location featuring shadow mass figures. The Tillie Pierce House allegedly has shadow play and a mysterious boom that reverberates through the house every night at 3:02 AM. People have reported residual haunting in the form of battle amidst a mysterious, sudden fog near Sachs Bridge. Editor's Note: Stories of this infamous covered bridge abound. Several stories persist of paranormal activity at Little Round Top. One such story involves American Civil War re-enactors working as extras on the film Gettysburg who claim to have been visited by a man in Union soldier dress they assumed worked with the movie. He passed them ammunition and left where the men assumed the ammo to be blank rounds but realized it to be musket rounds. Later, they would learn they dated back to the time period and were in pristine condition. The Jennie Wade House is reputed to be haunted by orphaned children. The Farnsworth House Inn is reported to be haunted by the ghosts of women, children, cats, a nurse named Mary, and Confederate soldiers, notably "Walter" who is known to harm women. The Devil's Den is reputed to be haunted by soldiers of the Battle of Gettysburg, Second Day. One infamous soldier in particular with long grey hair, dirty, torn buckskin clothing, a large floppy hat, and no shoes. Spring-heeled Jack was described by people who claimed to have seen him as having a terrifying and frightful appearance, with diabolical physiognomy, clawed hands, and eyes that "resembled red balls of fire". One report claimed that, beneath a black cloak, he wore a helmet and a tight-fitting white garment like an oilskin. Many stories also mention a "Devil-like" aspect. Others said he was tall and thin, with the appearance of agentleman. Several reports mention that he could breathe out blue and white flames and that he wore sharp metallic claws at his fingertips. At least two people claimed that he was able to speak comprehensible English. Ogopogo or Naitaka (Salish: n'ha-a-itk, "lake demon") is the name given to a cryptid lake monster reported to live in Okanagan Lake, inBritish Columbia, Canada. Ogopogo has been allegedly seen by First Nations people since the 19th century. The most common description of Ogopogo is a 40 to 50-foot-long (12 to 15 m) sea serpent. On Nov. 12, 1966, five men who were digging a grave at a cemetery near Clendenin, WV claimed to see a man-like figure fly low from the trees over their heads. This is often attributed as the first known sighting of what would become known as the Mothman. The Jersey Devil is a legendary creature or cryptid said to inhabit the Pine Barrens of Southern New Jersey, United States. The creature is often described as a flying biped with hooves, but there are many different variations. The common description is that of a kangaroo-like creature with the head of a goat, leathery bat-like wings, horns, small arms with clawed hands, cloven hooves and a forked tail. It has been reported to move quickly and often is described as emitting a "blood-curdling scream...."
The Beast of Bray Road is described by purported witnesses in several ways: as a bear-like creature, as a hairy biped resembling Bigfoot, and as an unusually large (2–4 feet tall on all fours, 7 feet tall standing up) intelligent wolf-like creature apt to walk on its hind legs and weighing 400-700 pounds. It also said that its fur is a brown gray color resembling a dog or bear. Although the Beast of Bray Road has not been seen to transform from a human into a wolf in any of the sightings, it has been labeled a werewolf in newspaper articles. Have a suggestion? Submit it!